The Nonprofit Quarterly Newswire (July 8th) reprinted a 2007 study showing “ The Best and Worst of Board Chairs.” Based on personal interview and online surveys, conducted by Yvonne Harrison & Vic Murphy, the study showed five major clusters for effective nonprofit chairs and one cluster for ineffective behavior. Effective chairs had; 1. Relationship Competencies; 2. Commitment & Action Competencies, 3. Analytical Skill Competencies; 4. “Willingness to Create” Competencies; 5. Ability to Influence Competencies. Ineffective Chairs had: Dominating Behavior. I thought it would be helpful to show this leadership characteristic information along with the action attributes from previous blog. The action attributes Were developed from my field insights into the action attributes of effective chairs. A nonprofit CEO’s professional attributes are the topic of dozens, perhaps even thousands, of articles. However this is not the case with Board Chairs. 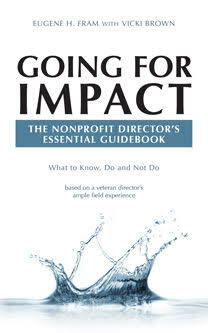 Following are my views of the professional attributes a nonprofit Board Chair needs to have to operate effectively. Has sufficient time to meet with management, when requested. Knows the difference between being consultative and being a micro-manager. Establishes a professional environment for the board, management and staff. Is respectful, and celebrate the accomplishments, of the management and staff. Has a leadership quality that resonates with the reality that many of the nonprofit’s organizational outcomes can’t be easily measured directly and quantitatively. Yet, calls for robust evaluations of all outcomes, quantitatively where data are available, and with imperfect metrics for more qualitative outcomes. Establishes a “civil discussion” atmosphere for board meetings. Know how to diffuse minutiae discussions and keep such topics from board agendas. Makes wise use of volunteer time. Works well with the CEO. Is respectful of the CEO’s management qualifications and abilities. Works to improve the diversity of the board membership to meet the needs of the organization. Wants his or her board to have a long-range impact. Source: Eugene Fram with Vicky Brown (2011) “Policy vs. Paper Clips” Third Edition, Available on Amazon.com.Jerry Talley and Eugene Fram (2010), “Using Imperfect Metrics Well: Tracking Progress And Driving Change,” Leader to Leader Journal, winter, pp.52-58.